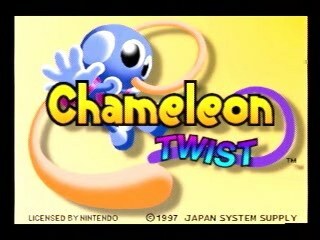 Released in December 1997 by Japan Supply System, Chameleon Twist was one of the first Mario 64 clones to hit the N64. The game stars chameleon/human hybrids that can use their tongue in any way you can imagine. Everything revolves around their long, sticky appendages -- it's difficult to get far without using them to solve a puzzle or conquer an obstacle. The goal of the game is rather nebulous; get to the end of each stage and be confused about the lame Alice in Wonderland references. Best time: Single-segment 0:11:54 by Kevin 'neskamikaze' LaLonde on 2010-04-15. Best 100%: Single-segment 0:43:00 by David 'marshmallow' Gibbons on 2004-12-26. Best time: Single-segment 0:11:54 by Kevin LaLonde. I'm one second slower than the TAS here, and that's with a couple small mistakes. I get hung up on the entrance to the cave, and I miss at the beginning of my second shot on the boss, but I use a strategy the TAS doesn't. I bring in two spiders into the room with the golems so that I don't have to wait for the spiders in there to fall. Do you want to skip this level? I don't know how I got the time that I did because it looks pretty gross to me, easily the lowlight of the run. I screwed up horribly in the room with the bomb in the center, I missed the jump around the corner (though that jump is very tricky and often miss it more than once) and I fall on the second bridge. However, I got very lucky in other areas, such as getting the circle in the first box I tried and the boss not charging me once. I made my goal time (sub 2:10) but this could have gone much better. However, because of the great luck I got I'll try not to complain too much (as well as the execution of the last two levels). I tied my all-time best with this performance (hundreds of attempts), though there still are a few things to be addressed. I don't know what happened in the checkered rooms where I spin on the platforms, I kept going the wrong direction and spent a little too much time spinning. I didn't get the best of luck with the moving platforms, but I made do with them. However, that was the best cake battle I've ever gotten and the mistakes in this level were very small. Only four levels? Feels like an NES game... anyway, this level also went extremely well as opposed to normal, as this killed many a good run. I got lucky with the first mirror room, but not as lucky in the ghost platform room afterwards (that's what I call them). When skipping platforms you have to have very precise jumps so I was cautious. Sometimes you can slip through the fires coming out of the wheel but taking the hit is still faster than clearing a path. I get unlucky in the second mirror room, but I'm paid off in the final room before the boss. That is the hardest part of the entire run and I almost never can do it without a fall, but I did it here. The shortcut on top is another improvement over the TAS. This was also an all-time best for me, as I can normally slip as far down as 4:30 on this level. And that's it. A total of 11:54, a decent run for a decent game. And no, I'm not improving the 100%, this is as far as it goes with Chameleon Twist. Single-segment 100% 0:43:00 by David 'marshmallow' Gibbons. Collecting all the crowns was both fun and irritating. This run could be done faster, and I had originally intended to redo it (with Davy, my hero) but unfortunately for all Chameleon Twist fans across the globe (that's both of you) I decided to keep this. It's good overall, but there are some embarassing moments in Bomb Land and the pool table in the Ghost Castle was just ridiculously slow (combine bad luck, bad camera angles, and a bad player -- ouch). I think a perfect run could probably break 40:00 -- that's how much the pool table rocked me. I don't want to say this game is random, but let's say I found a LOT of ways to fail horribly in pretty much every room that involves spinning violently around wooden poles with your tongue, usually a new one each time. Poor Linda, suffering from so many potential euphemisms. Feel the power of Ant Land's jive.